This was the very first recipe I posted on my blog back in 2012. At this point I had been on the plan four weeks and lost 12lb eating lots of exciting new meals and trying out lots of new recipes. It was after the realisation that I could eat delicious food and lose weight that I started my blog up and I haven’t looked back since! Begin by pan frying your salmon for 2 minutes on each side in 1Kal. Once cooked, remove the salmon from the pan and set to one side. Spray the same pan with 1Kal (I use a frying pan) and fry ginger garlic and chilli for a minute or so. Add the zest and juice of half a lime and then add the soy sauce and honey. Let this cook for a minute or so until the mixture reduces down a little and goes sticky, then pop your salmon back into the teriyaki frying pan and cook for a further minute drizzling the sauce over the salmon. In a separate pan (I used a wok) stir fry your peppers, onions, mushrooms, cabbage, carrots and spinach in a little soy sauce until peppers start to soften. Pop your noodles into the veg pan to warm though, mix and squeeze on a little lime. 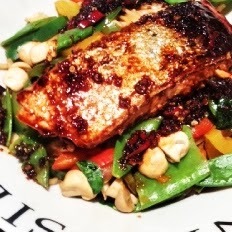 Serve your salmon on top of your bed of vegetables and noodles and drizzle on the teriyaki sauce to finish. I made the sauce a little runnier (by adding a little water) so that it could also be drizzled on the veg and noodles. Omit noodles for a lower pro point option (minus 5sp). I also drizzle the juice of the rest of the lime over to finish. Glad it went down well Seana! I’m making this tonight, can’t wait! I’ve repointed it as 6 points just for the noodles (Sharwoods Medium Straight to Wok 150g per portion) as the rest are zero foods! I’m making this tonight, can’t wait! I’ve repointed it for WW Flex as 8 points for the honey and the noodles (Sharwoods Medium Straight to Wok 150g per portion) as the rest are zero foods!